Thanks to the occidental misinterpretation of Karate, most practitioners who pursue the martial art do so chasing some idolised pseudo fighting system, that somehow teach ancient methods of combat capable of killing in a single blow. For the true karateka (practitioner of karate), Karate is considered as an internal conflict which can be won only through self discipline and diligent training. Karate-do (translates as 'Empty Hand') was developed in the Ryukyu Kingdom (currently Okinawa) prior to its annexation by Japan. With strong trade relations and cultural exchanges with the Ming Dynasty, the current model of Karate was derived from the indigenous fighting methods called 'Te' and 'Chinese Kempō'. The Ryukyu Kingdom then introduced the style to the mainland where the fighting system proliferated throughout the era of increased Japanese Militarism. During this time Japan was invading China and to distinguish the combat systems between the nations, the Japanese Art was formally changed to 'way of the empty hand' to be established as a path to self knowledge, self improvement, discipline and hard training. Karate is a striking fighting system that utilised punches, kicks, elbows and knees combined with open hand techniques such as locks, restraints, joint manipulation and throws. Karateka then use these techniques to administer sharp blows to pressure sensitive areas of an opponent's body. The fighting system is multifaceted with a wide variety of different strikes and blocking elements. Traditionally, the majority of strikes conform to a linear path for maximum point to point efficiency. Despite being a focused linear strike, the movement utilises power from thrust and hip rotation, putting the entire force of the body behind a single blow. Other strikes include sharp snapping reflexes to inflict damage as opposed to thrusts but the same principles apply. Blocking occurs on more of an arcing path used to effectively deflect and even unstable an opponent to create an opportunity for a counter-attack. Along the lines of deflection there are locks, grapples and throws that are used to restrain and dismount an opponent's balance. The study of Karate can be broken down into three distinct training methods. Kihon (translates as 'basics') are rudimentary drills run individually or in smaller group to learn the fundamentals of each technique, executed continuously in repetition. Kata (translates as 'form' or 'shape') is a series of choreographed offensive and defensive postures. These forms often utilise low and wide stances to increase leg strength, core balance and posture while gracefully executing techniques perfected through timing and rhythm. The vigorous arm movements serve to increase cardiovascular fitness and upper body strength. These drills are effective for keeping the body soft, supple and agile without any conditioning. Ideally kata is to be visualised as a pre-arranged fight choreographed against an invisible opponent. Nonetheless each movement and technique has the potential of being a fatal strike. Each kata is consistent of a variety of steps, turns, strikes, blocks and stances, a ritualised method of self training to practice perfect execution of form, breathing patterns and combat manoeuvring. Derived from each studied kata are the necessary techniques used in a sparring scenario, replacing the pre-arranged choreography for ones individual instinct. Kumite (translates as 'meeting of hands') is another physical element of Karate training. It is practiced for self-defence and as a competitive sport. Embracing the knowledge learnt from kihon conditioning and kata training and using it against an opponent. There are a few varying scenarios for kumite such as free sparring and full contact bouts. Karate has rightly been recognised as a professional sport that has unfortunately not made Olympic status. As a sport, Karate revolves around individual's kata and kumite performance. Kata is judged on style, technique and effective execution. Kumite is generally the more favoured competitive arena where opponents fight based on a scoring system. Points can be awarded on various merits depending on the type of competition. Some are awarded for good form, application and timing of techniques with mild contact while others are based on degree of impact. In any form of kumite, distance is the key to controlling the flow of the fight by both creating and closing the distance between your opponents. Creating distance will obviously nullify any close/mid range attack and any chance of locks, grapples and throws or result in techniques flailing about and completely missing. Closing the distance is best used to counter and off balance the opponent especially to apply the final blow or restraint to incapacitate the opponent. This also holds the greater risk, but when used appropriately can end the encounter with an immediate resolution. Beyond its physical application, Karate is considered a profound philosophical practice. Dojo-kun (translates as 'training hall oath') is a basic set of guidelines that a karateka would abide by that emphasises' strong ethical ideology and spiritual worth. Irrelevant of style or interpretation, these guiding principles are proposed to ground each practice within an ethical context both in and outside the Dojo (translate as 'training hall'). These principles allude to compassion, respect, patience, non-violence, humility and both an inward and outward calmness. This pursuit for self-perfection is the epitome of Karate, what true karatekaendeavour towards. There are a number of styles of Karate one can learn under and the differences between each vary from teachings, philosophical and ideological interpretations, lineage, general form and stances, use of weapons and their recognised kata list. Each differing style also conforms to a unique set of dojo-kun often set by its founder. 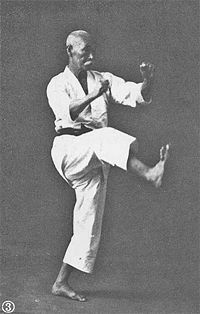 Each style can be described as either a 'hard style' or 'soft style' some like Shōtōkan-ryū Karate teach primarily hard, linear techniques with some soft, circular movements to advance students. Kyokushinkai Karate is known as the knockdown or full contact Karate, with great emphasis on realistic combat application and physical conditioning. Some styles are even named to reflect their own styles affiliation with Gōjū-ryū meaning the 'hard-soft style', obligatorily featuring both hard and soft techniques. With the aid of pop culture and cinema, Karate has become synonymous with all oriental based martial arts. Asian martial arts foray into mass popularity in the Western society was in part due to its syndication as a mainstream cinema genre. Even the stars of the silver screen practice the art with stars such as Sean Connery (Kyokushinkai), Michael Jai White (Shōtōkan-ryū, Gōjū-ryū and Kyokushikai), Jeanne-Claude Van Damme (Shōtōkan-ryū) and one of my personal heroes, Bear Grylls (Shōtōkan-ryū) are devout karateka. My advice is choosing a style that caters for you physical and spiritual needs as there is no crowned, ultimate martial art style. Karate is a cultural art that's not open to any disregard of tradition. As martial arts have already been consumed by mass commercialisation, it becomes increasingly difficult to avoid the McDojo's of the world. These schools charge high rates, teach very little and can fast track you to a black belt within a few years which are generally taught by woefully unqualified instructors with grave business ethics. Not exactly an ideal candidate be teaching you anything really. Already outlined are the huge benefits in studying Karate with exercises designed to increase power, strength, stamina, speed, agility, flexibility, muscle coordination aerobic exercise, anaerobic exercise and stress management. For those interested in becoming true karateka, I simply advise to go out and give it a try. For those still unsure, here's a little advice from Gichin Funakoshi, the 'father of modern Karate' who said "indecisiveness is a weakness".